This past week was a busy one for me. I headed down to LA on Friday to celebrate my friends getting married. Just as I pulled into LA, I managed to stop by Old Style Guitars for a short visit. I saw a posting on facebook a while back of this Airline amp that just called to me. It was a bit expensive and I hadn’t been able to come down to try it down until this day. Well, I tried it out and it was amazing! Meet my new Airline! Don’t be jealous M8. I still love you, too. The tremelo (which is what I cared about most) was deep and thick. The surprise is the reverb. The spring is encased in this cardboard box and sounds crappy in the grooviest way. It’s like a slapback delay/reverb in that it has this harsh first reaction which then smooths out. If I can figure out how to play it right, I bet it will be super cool and give an unfamiliar nuance to a tone. 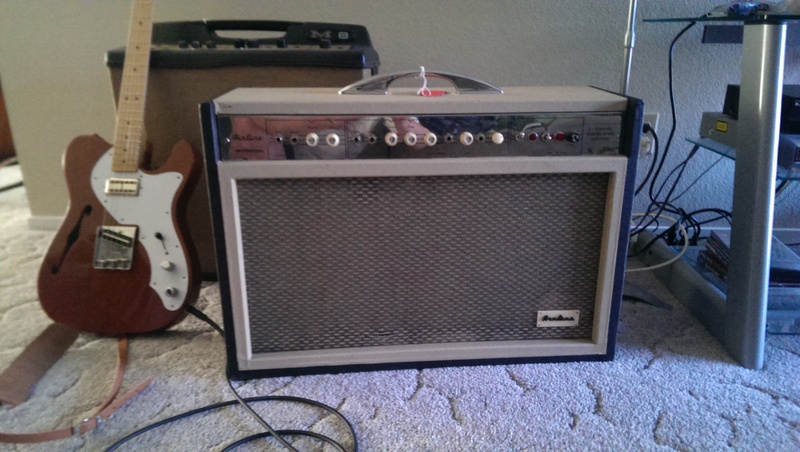 After trading a flurry of texts with Jason about the amp, I decided to get it. The key point is that I will never regret owning this amp. It’s true. I won’t. I’m going to enjoy learning how to use it. It’s the only amp of mine right now with 2 x 10″ speakers which I always thought was the right combo setup. I can already tell that they make a big difference. The low end feels great. The highs are clear without being too sparkly. After making this profound purchase, I had a great time celebrating with my friends in downtown LA. The next morning, I went with some friends down to San Diego to surprise one of my oldest friends for his birthday. That was a great day and I was really happy that I could make it down for that. After a relatively painless drive back from San Diego to LA, I then made the drive back to Merced. That was relatively painless. I listened to a really cool podcast interview with Johnny Marr which I found to be really insightful. Then I listened to another one with Allen Toussaint which was killer, especially since I’m spending a lot of time these days listening to old Lee Dorsey records. The very next morning, I packed the car with two of my acoustics and set out for San Francisco. 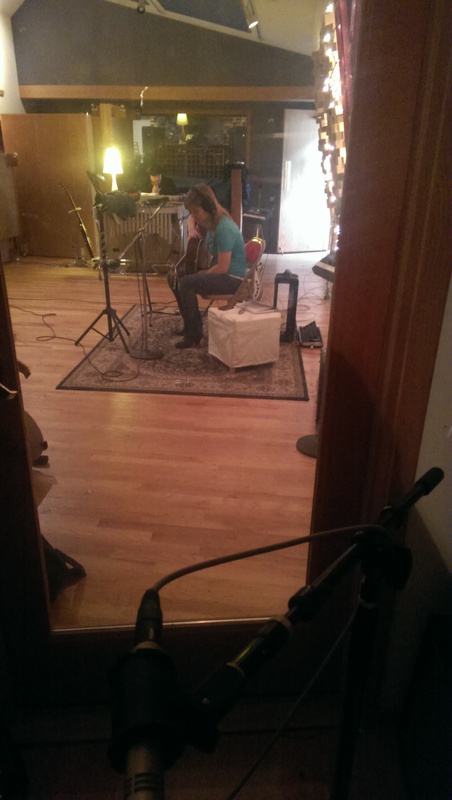 I got called by JJ at Decibelle for a session with Rachel Garlin. The band consisted of me on acoustic guitar, John-Paul McLean on bass, Rusty Miller on keys and electric guitar, and Michael Urbano on drums. Rachel played and sang on each song. It was pretty great band to play with. Everyone was really nice and supportive. Everyone but me ordered Hunan fish at lunch. I was the outcast. To be honest, I didn’t know about Rachel or her music until this session. I had just received a few demos by email and that was my introduction to her. I like her songs a lot. The more time I have spent with them, the more I like them. Plus, getting to know her was also quite cool. She brought cuties and mambas to the session. Killer! Tracking with Rachel Garlin at Decibelle. Rusty is in the back on the wurlitzer. Rachel has a really earnest voice. She doesn’t sing in ALL CAPS. Her guitar playing is really good. She fingerpicks very well. In fact, her solid playing was the reason for the key challenge I faced in the session which I’ll talk about in just a minute. With respect to her songs, they are structured quite differently from how I structure songs. I had a hard time following some of her changes since they are moves I hadn’t made before. They’re subtle things: holding a chord a little longer here, changing it there, but if it’s out of your normal routine, it can really mess with your head. Working on this session has caused me to think about getting out of routines I have in my own songwriting. That’s definitely an enormous positive experience to come out of doing this session. For each of the songs, Rachel played acoustic guitar and sang. Like I said before, she plays very well. For some of the songs, her acoustic guitar part is the foundation. So, for me, the key challenge in this session was figuring out what the heck to do. The question becomes, how do you play an acoustic guitar part that compliments a solid acoustic guitar foundation, but doesn’t add anything more to busy-up the song? For the recent Scott Gagner session I played, there were a couple of songs with a strong foundation of acoustic guitar that Scott played. For those songs, I was playing electric guitar, so I could mimic the kind of atmospheric parts that Bill Frisell did on Shawn Colvin’s last record, for example. I was rather pleased with myself about how those turned out. But for this session, I was playing acoustic guitar and those kinds of parts don’t work on acoustic. They sound trite, and don’t serve the songs. Anyway, I figured out some parts, and I think they came out okay. I must have played alright because Rachel asked me to come back and work on a few more songs with her. I gladly accepted since I was enjoying it and learning so much. For the next sessions, it was just Rachel and me playing. I think it was the very first song we did where she Travis-picked while she sang. Her Travis-picking is rock solid, so this challenge became even more acute. With some anxiety and panic, I asked JJ and Rachel for advice on what to do. I think it was JJ who first said something like, “pick along with Rachel, but not as much” or something like that. After that, Rachel and I played along a bit together to try and work out parts. When we were listening to playbacks, Rachel and I kind of agreed that it sounded almost like one guitar, but a little bit more. That’s how Rachel and I coined the term “one and a half guitars” for the sound. Travis-picking is based on an alternating bass line in quarter notes. With one and a half guitars, the idea is to play a sparse arpeggio of a different inversion of the chord in a time that weaves in and out of the alternating bass line. The nice thing about this is it can respond to and compliment the vocal melody naturally, which should set the rhythm of the part. Now, all of this technical speak is a posteriori based on my faulty memory of the situation. I wonder how well the tracks actually sound and how successful the approach worked. At any rate, I’m planning to spend some time trying to work out this approach to a guitar part since I think it could be really handy. So thanks to Rachel Garlin for inviting me to play on her records. I learned a lot and we managed to invent one and half guitars!